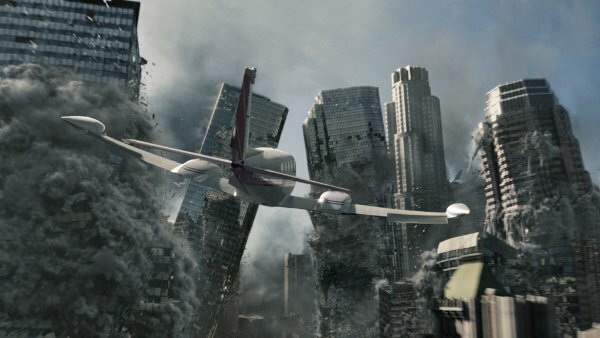 Apocalyptic movies are a sucessful genre, 2012 took $769,679,473 at the box office. By my rudimentary maths, working on an average ticket price of £8, this means 64,456,930 people (globally) have seen John Cusack fly a plane through tumbling skyscrapers (if you haven’t there’s a still below). Anyway, what’s the point of this…well, despite movie success, getting the public to appreciate real risks of emergencies is often a challenge. There are a number of reasons for this, not least that the range of heuristics and biases which limit all of our abilities to accurately percieve risk (and which are partly shaped by movies). However, the aspect that I’m focusing on here relates to accessibility, by which I mean the ease of understanding information, not whether it’s available in large print and different languages. To be clear, I don’t advocating “dumbing down” content, but I do think that there are ways of presenting information which facilitates it’s ease of use. Too often we conceptualise ‘the public’ as abstract dimwits with a reading age of 7 and no ability to have their own thoughts. I firmly oppose this stance and we should remember that “out there” are incredibly inteligent business people, entrepeneurs, professors, doctors and whole swathes of people exposed to complex information on a daily basis. Having a lead responsibility for risk assessment in London means I spend much of my time thinking about how we can communicate risk information both to professional partners, but also to the public. We’ve certainly seen the Rise of the Infographic over the last couple of years, as shown in the Google Trends graph below. I’m currently playing with some thoughts on how this infographic approach could be used in the context of risk assessment. Another recent approach that I’ve been trying recently is to avoid sending people directly to a risk register. A 40 page document doesn’t sound like something even I want to read, so why would anyone else? I discovered Prezi about 2 years ago, and have recently developed the presentation below to outline the London Risk Register. It’s already had nearly 1000 views, which is significantly more than the number of hits the London Risk Register has recieved. I’m not saying that’s an indicator of sucessful risk communication, but perhaps it indicates that proving risk information in a non traditional ways (by which I mean, not a document) is preferable? Take a look, what do you think? Is this a more convienient way, for the public and community, to recieve risk information? Does it break down any of the barriers associated with traditional methods, or are people just interested in the novelty of Prezi’s zooming?